Everyone, especially during emergency situations, will need a reliable flashlight that can last for as long as possible. After evaluating a couple brands in the market, we came up with the top choice – the SOLARAY PRO ZX-1 Professional Series Flashlight Kit. Currently, it is rated 4.9 out of 5 stars in Amazon and a total of 296 reviews, 96% of which are purely 5 star feedbacks. “It will never leave you in the dark” – this is breakthrough promise of this SOLARAY flashlight. Built to provide convenience, security, comfort and long lasting service, anyone can rely on this particular device, whether they are a typical homeowner or a night daredevil. The market has tons of options on tactical flashlights, making it harder for consumers to pick what’s best. We have tested out a few models, and here’s what we have to say – SOLARAY has hit the nail on the head on this one. Check out below for more in-depth details. The 6-inch long flashlight is packaged in a neat manner with each item separated from one another. Items included on the box are the 1200-lumen LED flashlight, 2 lithium batteries, a wrist strap, wall charger, battery holder, plastic battery sleeve, and one keychain that’s powered that illuminates using solar energy. The great thing about this little guy is that it is usable and lights brightly right after we lift it out of the box. Performance-wise, the SOLARAY PROX ZX-1 perfectly delivers what it is designed to do – to bring out the brightest light even on the dimmest setting. As a matter of fact, when you look directly at it, be sure not to point the flashlight directly to your eyes when it is turned on. Like the latest flashlight models to date, it features 5 different modes: low, medium, bright, strobe and SOS. These modes make it possible for one to use it not only at home, but also for camping trips, night biking, hunting, fishing, hiking, car breakdown, power interruption, security and others. The battery included in the package are two rechargeable AAAs, although you will only need one to power it up. This means you will have a spare battery in case of emergency. The charger is easy to store. When not in use, the socket folds in; taking up less space for your convenience. Each AAA battery can charge up to 500 times. An added bonus is the backup case, which can accommodate three AAA batteries. The SOLARAY PRO ZX-1 is also equipped with ZOOM feature. This add-on allows one to light up a broad area or zoom in on a particular spot when necessary. Little as it may seem, the comfort and ease of use is impressive since it is light, compact, and coated with a nice embossed black finish that’s reinforced and hardened to last for years. The keychain/mini LED light comes in handy when you run out of battery power. It is geared with three little white beams so you can easily pick something up or unlock your doors when you need to. Like the flashlight itself, it is super portable and hangs perfectly with your set of keys. 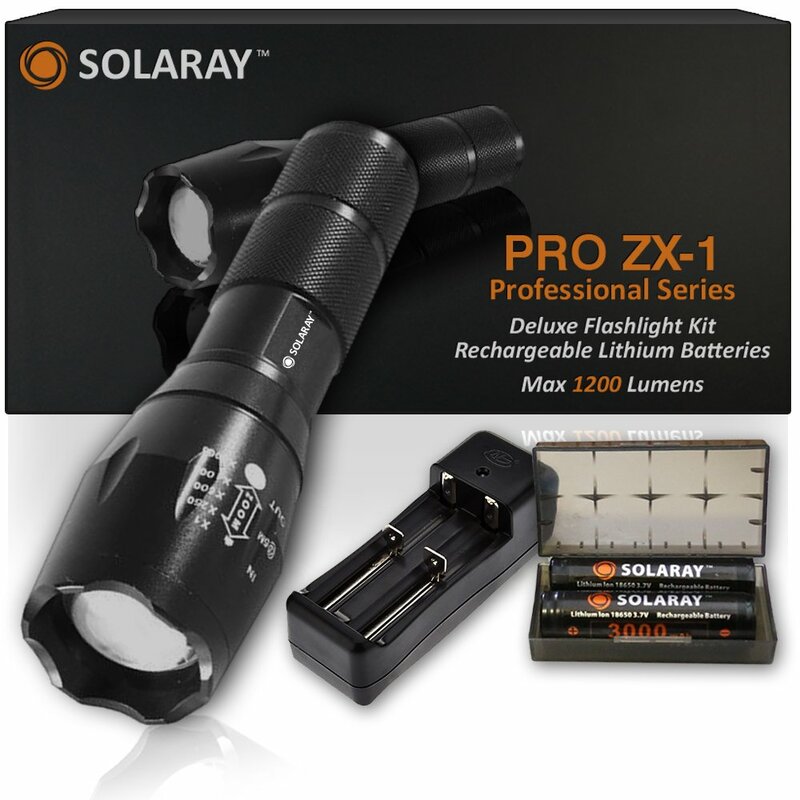 Complaints are not very common when it comes to the SOLARAY PRO ZX-1 Tactical Flashlight. However, some have claimed it doesn’t have the brightness to their liking. At the moment, people are raving about its efficiency, durability, and affordability. Especially in Amazon where tons of adventurers and homeowners tested this light out. One customer said they have dropped it a few times and it’s still working like new. Overall, the SOLARAY PRO ZX-1 is considered a good buy considering the low price, quality build, and brightness it delivers. Its light is good enough to light a broad environment, making anything visible as they should be. It is also portable, comfortable to use, and light when it comes to weight. It may be tiny in size, but it’s fully packed with useful features and accessories that will help anyone in case of power outage or sudden camping or outdoor trips. The coolest flashlight you could ever own – this is just one way that the PRO ZX-1 is described by its satisfied clients.